World’s biggest independent Mobile app store GetJar today announced that it has reached three million downloads per day. With this achievement GetJar is second only to Apple iTunes, with over 1 billion downloads till the time. GetJar app store is available across all mobile platforms including Android, BlackBrry, Java, iPhone, Symbian and also for Windows Mobile. It provides more than 70,000 mobile applications to consumers in more than 200 countries. 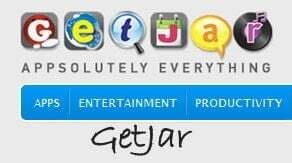 According to the GetJar, As of July 2010, FaceBook, eBuddy Messenger YouTube, Nimbuzz and Yahoo! Mobile remained among the top, with Games “Warships Sea on Fire” and “Racing Mania” top among its category. Other leading categories include Lifestyle, Entertainment, Music, Maps, search, Financial, Sports and productivity downloads. On the contrary, Apple has previously stated that updates to existing software are not counted n the download numbers so the actual figure would in fact be far higher. In contrast GetJar counts every download web even if a user re-downloads an app or gets the latest update. As such the disparity between the two services is even more drastic.